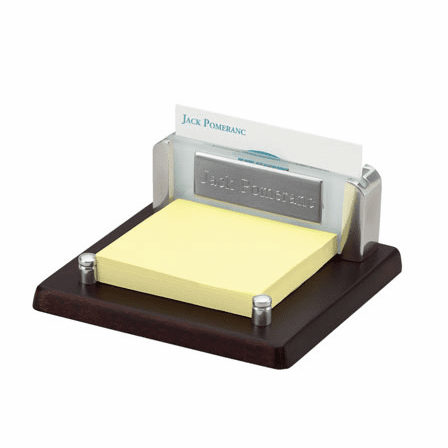 A welcome addition to the desk of any busy professional, this espresso finish desktop memo pad and business card holder is ideal for men and women. The base is made from a dark brown, espresso finished wood with a felt lined bottom. 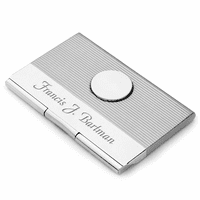 It features silver metal finish appointmen's with an acrylic inlay between the card holder columns. 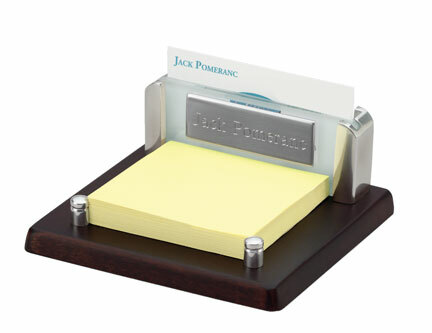 It has a business card holder as well as a Post-It note pad holder and you can add a custom touch with the engraving of your choice at no extra charge. 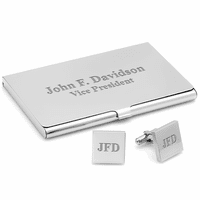 This memo pad and business card holder comes package in a gift gift box, ready to be presented to somebody important. Dimensions: 4 1/2" x 4 1/4" x 1 3/4"
I had ordered this item for my boss - a high level health care executive. 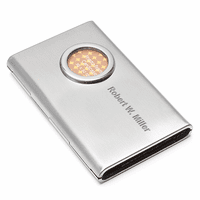 The engraving on the item was so small that you needed a magnifying glass to see it. I contacted the company and they immediately responded and "wanted to make it right." They said they would send another one with changes in wording to reduce the number of letters in order to make the print larger. When I received the updated version, the print was still so small you had to get right up to it to see what the engraving was. 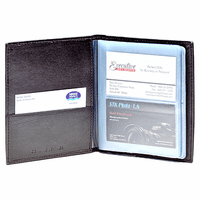 The item is a business card holder with a space for 3 x 3 sticky notes. The space for the sticky notes was not sufficient as you have to jam the sticky notes between the posts which caused the paper to bend and made it hard to use. It was so bad that I didn't even give it to my boss and I will probably just toss it. ProsThe follow up from the company upon my call concerning my dissatisfaction. ConsThe need to limit the number of characters that can be placed on an item so that the engraving can be done in an appropriate size. The item is not the quality I would expect for a $49 item. Looks very nice on desk!